These elements are, as we have already noted, the conditions conducive to a school of paleography in Cluj, which is another major objective of the research project. In the first months of next year we will continue the work of settling and deepening the knowledge of paleography; as we have already noted, Professor Dominique Poirel will come to Cluj for another week full of classes - most likely this will take place in March. In January, anticipating the arrival of Professor Poirel, will organize a workshop in which each team member will present the results of their work and others' manuscripts. Since April, each team member will write an article in a foreign language (preferably French, English or German) reflecting the results of work done in the first 6 months of the project; this presentation will be a historical and philosophical, its purpose being the publication of results in journals abroad. Each study will be followed by a short Latin Edition of the unpublished identified text which was analyzed by each team member. In this way we achieve the project objectives, namely, publication of articles in international scientific level containing results based on CNCS grant. 1º and continue studying more commentaries: Alexandra Baneu will continue the study of the commentary, attributed to Johannes of Mallingys in the manuscript Worcester Cathedral Library, Q.90, f. 57r-64v. Iulia Szekely will study the commentary transmitted in the manuscript Bibliotheca Amploniana, CA. 4º 316, ff. 43r-54v. Alexander Baumgarten will continue the transcription, comparison and study of the historical and doctrinal context in which the comment transmitted in four manuscripts was composed: Krakow, Biblioteka Jagiellonska, 2088, f. 300-322 ; Wroclaw, Ossolineum, 734/1, f. 2r-31v ; Wroclaw, Biblioteka Uniwersytecka, Mil. II 78, f. 176r-193v ; Praha, Knihova metropolitani kapitaly, ms. 1599/O. XV, f. 63a-81a. Dragos Calma will transcribe and study the commentary from two manuscripts: Wien, Österreichischen Nationalbibliothek, 2303, f. 55r-61v ; Zwickau, Ratsschulbibliothek, Ms. I, XII, 1, f. 132v-138v. 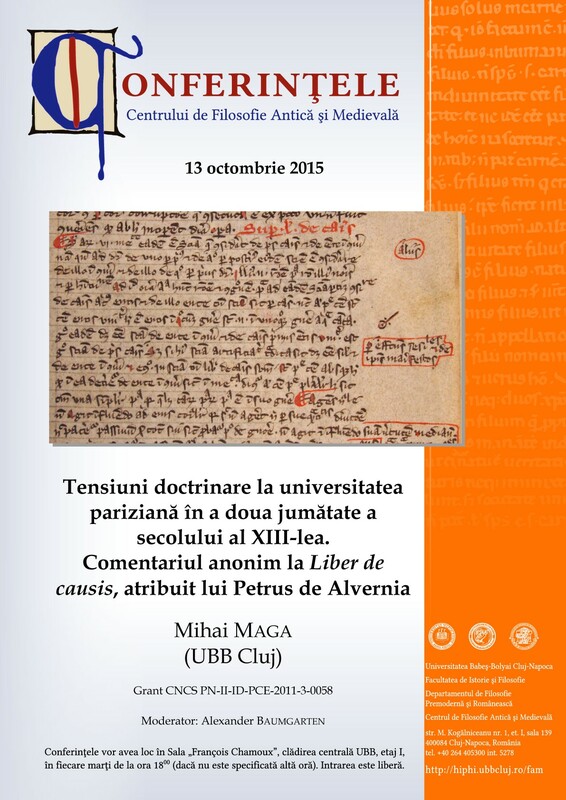 Mihai Maga deepen the comparison of an important commentary preserved in three manuscripts: Paris, BnF, lat. 15815, f. 172vb-175rb ; Paris, BnF, lat. 15819, f. 308rb - 309ra ; Wien, Österreichischen Nationalbibliothek, 2330, f. 107ra-110vb. Mihai Maga's study will be presented in the months from April to March for publishing one of the following magazines (classified ERIH) Vivarium (Amsterdam), Revue des sciences et théologiques philosophiques (Paris) or the Théologie et Philosophie Médiévales Recherches (Leuven). 3º developing international links with various research centers in Europe and America: attaching of the center of Cluj in various research programs, grants and symposia will be taken into account, in order to obtain additional funds for the organization of an International Colloquium in Cluj-Napoca in autumn of 2014. The work of the members of the team will mainly focus on writing the definitive versions of the articles for the volume D. Calma (ed. ), Neoplatonism from the 13th to the 17th Century. Unpublished Commentaries on 'Liber de causis' and 'Elementatio Theologica' (ISBN 978-2-503-55474-7), Brepols. Articles are written in a foreign language, English or French, and will be sent to the members of the editorial board of Studia artisarum series, where volume has been accepted for publication. The standard procedure of the series is to have peer-reviews for all the articles, they will be sent to external evaluators (researchers from various international academic institutions, recognized specialists in their fields of expertise). In 2014 we intend to accomplish researches in different libraries in Germany and Poland, and present the results of our research in different national and international conferences. In 2015 the team members' work will focus on the dissemination of research results on the manuscript tradition of the commentaries on the anonymous treatise "Liber de causis" in medieval Latin culture space. The following volumes will be published: Neoplatonism in the Middle Ages. vol. I. New Commentaries on Liber de causis (ca. 1250-1350) and D. Calma (ed. ), Neoplatonism in the Middle Ages. vol. II. New Commentaries on Liber de causis and Elementatio theologica (ca. 1350-1500). Furthermore, conferences and workshops will be organized where grant members will confront the innovations resulting from transcription and analysis of the commentaries with the scientific community in Romania and abroad.